"A Tale of The Cove"
It all started off with a drink in The Drunken Sailor, which was the usual Pig-swill (brewed by Pete the pig), and while trying to ignore the taste, overhearing Bristle Bob mention "I got it stashed away, so meet me at the Black Stones and we can finish it". This led to a swift exit with thoughts of profit and a chance of promotion, to start gathering the troop, to follow Bristle Bob and get a piece of the action at the cove. After all, how difficult could it be overpowering a few pyrates? This is a rocky beach place, with rock pools and driftwood/washed up debris. It has a rough circle of stones in the middle of the cove, near a rock pool, where Bristle Bob can be seen, looking a bit worse for wear. For this Strange Grogge adventure I used the excellent Heroic Maps Coasts series of Battlemaps. They are dynamic geomorph print and play products available on Wargame Vault. They can be printed out or used in your favourite virtual tabletop software. The first time a model makes it into the circle of stones, they realise that Bristle Bob is not just a bit worse for wear, he's much worse, in fact he is dead, having been attacked several times. Fortunately, Bob still has a bag in his hands. Unfortunately his attackers are still around, having hidden when they heard the crews approaching. 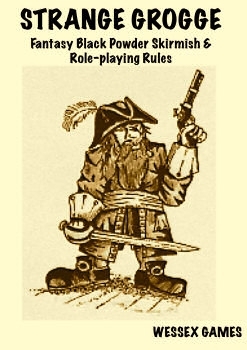 Roll a D6 to determine the race of the attackers, and then place D3+1 of them (armed as model) inside the circle but not in Close Combat with the player's model. The player's model may make one bonus action straight away due to the adrenaline rushing through them. In case you want to try this scenario with other crews or more players, here are some other crews that I have created. Cut’u come from beneath the waves, raiding seawrecks for equipment, guarding their underwater cities and now becoming a plague upon sea vessels as well. Newts are smaller weaker cousins of the Cut’u, who make up for this with their brainpower, managing to collect many valuable items from seawrecks and other sources, which they use to hire bigger races, such as the Angler Fishman Ogres, as bodyguards and muscle for their crews. To represent this, after a Newt crew has been generated, with experience and their doubloon hoard, two newts (one of which must have at least avg experience) and 5gc may be exchanged for one Angler Fishman Ogre with an average base salt. Ottermen are generally river and shored based, naturally at home as fishermen and sailors and an amenable race. But with increasing amounts of raiding and conflict with other races, there are many that feel that a more war-like stance is needed, and the most scarred are even willing to take the fight to the enemy, to replace that which has been taken. Dwarf Pyrates - I would recommend looking to Macrocosm for their new range of Dwarf models, as they inspired me. Ottermen Pyrates - I would recommend looking to the Otharmann Empire household warrior packs from Alternative Armies. Halfling Pyrates - I would recommend looking to Macrocosm for their new range of Halfling models, as they inspired me. You can buy Strange Grogge right now over on Wargame Vault, currently discounted by 50% to a mere £2.50. If you don't own them, do yourself a favour and grab them now. This article was written exclusively for Orcs in the Webbe and was first published on the 4th December 2017 as part of it's 2017 Advent Calendar.